Colorado Blue Spruce This tree is an ‘Idaho Preferred’ Plant. The Colorado Blue Spruce with its graceful branches awaiting winter snow evokes images of the mountains. Its beautiful silvery blue-green needles are resistant to deer. It has become one of the country’s most popular ornamentals. It is pyramid-shaped and is often used for Christmas trees or as an ornamental. It prefers soil that is a bit heavier, full sun and open air circulation. It is also drought tolerant once established. 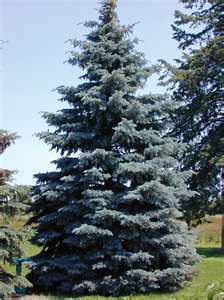 Colorado Blue Spruce is a native plant for our area. This conifer is often planted as a windbreak or as an ornamental in a large yard. It is also used as a specimen plant or for accent. Colorado Blue Spruce likes to be planted in full sun.